Battery Backup | General Highway Products, Inc.
General Highway Products offers the most advanced communication technologies available in the industry today for uninterruptible power supplies. 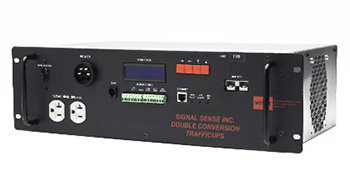 The Signal Sense SSDC Series UPS is a family of True On-Line Double Conversion power supplies designed to handle today’s most demanding traffic signal and traffic ITS applications. Available in three sizes, a 700 W, 1100 W, and 1400 W. These three rugged UPS’s provide seamless, pure sign wave power at all times, with the added benefit of a continuous on-line design that provides full power conditioning, filtering and spike and surge protection. The SSDC series UPS offers as standard features: full time Ethernet capability; a comprehensive LCD digital display of all operating functions, and unit programming, as well as advanced alarm communication functions that allow remote or local monitoring.